Explore over 1,300 presets and high-powered sound design tools in Cypher2, which works as a standalone application or VST, AU and AAX plug-in for popular DAWs. Cypher2 combines analogue-modelled oscillators, a stack of filters and effects, an advanced step sequencer and MPE compatibility in one high-powered desktop synth. Journey to uncharted sonic horizons with Cypher2, the new premium software synthesizer from ROLI and FXpansion. Years in the making, the FXpansion and ROLI team have built on the best features from Strobe2 and Cypher from DCAM Synth Squad to create a high-powered desktop instrument that lets you manipulate sound in almost infinite directions. Featuring a vast range of expressive presets and extensive sound design tools, Cypher2 makes every performance a true adventure in sound. Cypher2 is available to purchase now on fxpansion.com for $199 (£159, €179) — with a special discount price of $99 (€89, £79) for Seaboard and BLOCKS creators. Seaboard and BLOCKS creators can access their discount link via their MyROLI account (learn how below). Over 1300 diverse and exciting sounds in total (including both 5D and 2D presets) have been carefully crafted for Cypher2 by veteran FXpansion and ROLI sound designers. From atmospheric and sharp-edged electronics like PD Antarctica Ice Sweep 5D, to otherworldly interpretations of acoustic instruments like WI Harmonica 5D, there’s an entire sonic universe to discover. “This project has been a true labour of love for the FXpansion team and ROLI’s veteran sound designers”, says Angus Hewlett, founder of FXpansion and now VP of Engineering at ROLI. “The expressive power of 5D MPE and the sonic fidelity of circuit modeled synthesizer components is a uniquely powerful combination: an advanced software synthesizer which responds to your playing like no other”. Cypher2 can be used as a standalone desktop application or as a plug-in instrument in your favorite DAW. Its compatible with both standard MIDI controllers and MIDI Polyphonic Expression (MPE)-enabled instruments. Download Cypher2 today to start shaping sound in uniquely expressive ways. Your sonic adventure awaits! 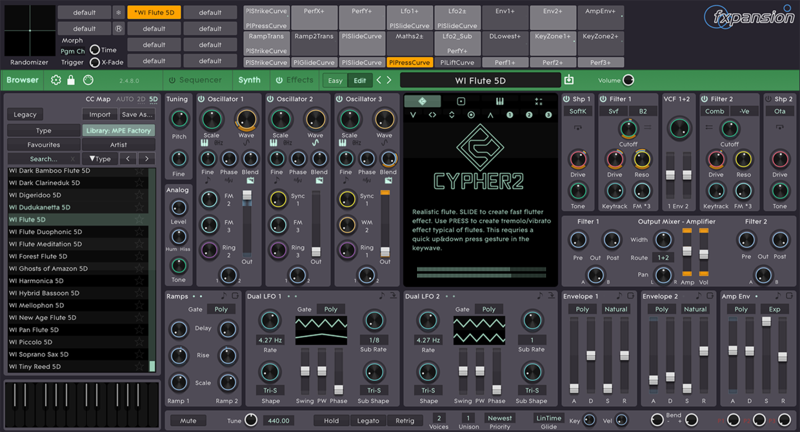 Cypher2 is now available as a digital download for $199 (£159, €179) on fxpansion.com. If you own a Seaboard or BLOCKS you can download Cypher2 at a discounted price of $99 (€89, £79). Seaboard and BLOCKS creators can find their unique Cypher2 discount link by logging into their MyROLI account and selecting the link in the green 'Save 50% off Cypher2' promotion section. This will take you to the FXpansion store, where you can purchase Cypher2 at a discount. Strobe2 and DCAM Synth Squad creators also qualify for the special upgrade price of $99 (€89, £79). The relevant upgrade path can be selected at checkout on fxpansion.com.